James Cropper PLC create some of the world’s most distinctive and technically advanced paper products, using materials from cotton and wood to carbon fibre. We have developed an app for James Cropper which was trialled at the recent Packaging Innovations & Luxury Packaging exhibition at London’s Olympia. The cross platform mobile application is essentially a product configuration tool which generates a 3D bag or box. James Cropper’s CEO, Phil Wild, came up with the idea after using a similar app produced by a large paint manufacturer. Phil used the app to decorate his home. The app allowed him to take photos of rooms then apply different paint colours to the walls. The app saved time and expense by producing a digital representation of the finished room. Phil found that the app could provide a similar function for the sales team at James Cropper. The main problem for the sales team had been the time and cost involved in producing a packaging prototype using specific colours and embosses. Phil wanted to reduce the time taken to produce a prototype from weeks to seconds and realised that developing an app was the solution. The app configuration tool allows users to create a standard gift box or bag. The first stage is colour application and provides options from the James Cropper range. 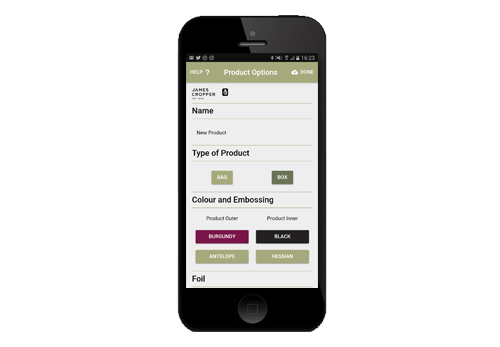 An additional feature, within the app development, is the ability for users to apply their own bespoke or corporate colours. This is followed by the selection of emboss patterns ranging from Pinhead to Antelope finishes. The final process is for users to apply their logo which can be rendered in silver or gold foil just to add an element of luxury. The app’s trial at Olympia was extremely well received. Now luxury clients can view their packaging in 3D using their own logo and corporate colours within a matter of seconds.